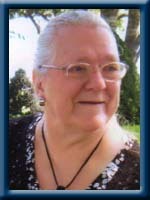 STEWART—Rhoda May, 72, of Pleasant River, Queens County, died peacefully in Queens General Hospital, Liverpool on Friday, February 17th, 2012. Born in Brookfield Mines, Queens county, she was a daughter of the late George and Nina (Nowe) Stewart. Surviving are her sister Evelyn Herman of Maitland Bridge and her brother Max of Springfield as well as many nieces and nephews. She was predeceased by her sister Erma Mailman and her brother Hugh. I’m very sorry that I can’t be there on Monday to celebrate Rhoda’s life and mourn her passing. I will miss seeing her at mom’s summer gatherings at the farm. My thoughts are with all of you. Lots of love from Lisa, Mark, Lydia & Catherine. If allways having a smile and a wave for a passing neighbor is noticed by the Lord, as it was by me, I’am sure you are well in his favour. We send our sincere condolences to all of you at this difficult time. Be at peace knowing Rhoda will always be with you, in your heart. Ahh.. Rhoda, I so loved her. What a precious person. So sorry for the loss that all will feel in loosing her. May her special tender heart for life always be held dear. Sleep well Rhoda I have so many happy memories of you when I was a child, you were a precious person and your life touched us all . Sorry to hear of your loss. I know she will be missed by you all. Cherish those special memories and hold them close to your heart. Sorry to hear of Rhoda’s passing. She was a lovely lady.